Hook traveling (sometimes also called topping) gives some challenges when building tower crane models. Other builders have been struggling with this topic as well, as can be found on some internet sites. In this picture my Bailey crane model is under construction. 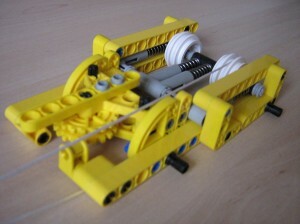 The trolley moves by means of a winch on which 2 wires are spooled. 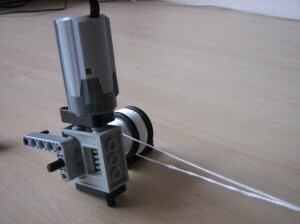 One wire is directly attached to the trolley, while the other one passes through the tip of the jib and back to the trolley. In this picture the separate parts which enable hook traveling are taken out of the crane for better understanding. The gray part, the winch, powered by a medium PF motor is located inside the machinery house at the end of the counter jib. The counter jib is the part of the jib aft of the tower and houses all the heavy winches, switchgear and counter weight. The black part is the trolley, which is hanging from wheels, which travel over rails along the jib. 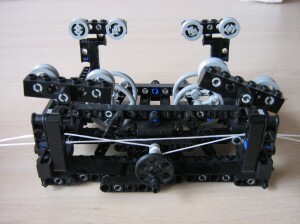 The gray wheels in the middle are the sheaves over which the hoisting wire runs. The yellow part is located in the tip of the jib. Here all the sheaves for main hook hoisting and for main and auxiliary hook traveling. Below each of the parts are shown in more detail. The winch drum is split in two. From one side the wire is spooling off, while on the other side the wire is spooling on, when the drum rotates. In reality this is the same, however the wires are spooled with 1 layer only onto a grooved drum. The diameter and length of the drum is chosen such that the trolley can travel the full length of the jib, without the need for a second layer of wire on the drum. Lego has no grooved drums so I needed to find a way to cope with the different speed of the wires, while 1 drum part grows thicker and thicker with wire, while the other parts gets thinner. The different diameters of the drums filled with wire is clearly visible above. The result of this is, if no additional measures are taken, that one of the wires will always be slack. 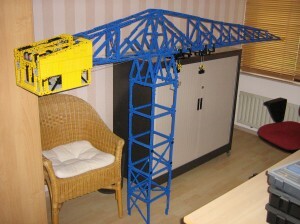 This is acceptable to a certain level, as can be seen in real tower cranes, but for my model, given the small diameter of drum compared to the large distance to be travelled, would result in a wide loop of slack wire hanging below the jib. For the Bailey crane model I introduced spring loaded return sheaves in the tip of the jib. With the trolley about half way the jib, the wires were wound evenly onto the both sides of the drum. Then the wire ends which were meeting at the trolley were tightened such that the springs were about half way compressed. The result was a much less slack wire when nearing the end of the way of travel. Here you can see the way the wires are tightened on the trolley. 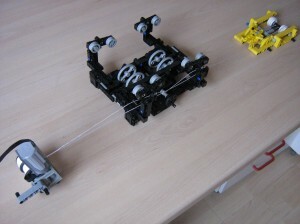 Both wires are spooled onto a shaft, which is secured by the black wedge belt wheel and a pin. The other wire is passing over the trolley, without connection.